On Saturday, February 14th, participating Pure Barre studios across the country will be offering a free class, plus goodies from our partners. Here's how to sign up. Show your body some love this Valentine's Day and make a date with the barre—the ballet barre, that is. We've teamed up with Pure Barre to offer you the chance to strengthen and sculpt your body in one totally-toning class. On Saturday, February 14th, participating Pure Barre studios across the country will be offering a free class, plus goodies from our partners. You'll sweat it out while targeting all your trouble spots—arms, abs, hips, and thighs—in a fun, low-impact workout. Want to sign up? 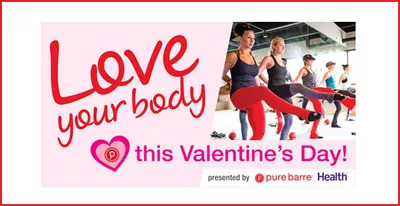 Go to purebarre.com/loveyourbody and get your free class with code "LOVEYOURBODY." It's that easy! Round up your friends and make it a "Galentine's" date at the barre.